Firstly, presumably there must be sufficient evidence to make the claim and substantiate it. Secondly though, how does this help contemporary modern day issues with the two countries and wider world view, other than the recognition that power-possessors need to be held accountable for their actions. The history is trying to estimate the number of people who were murdered - 1915–1917 - while the dark times of The Massacre of the Armenians. It is estimated that between 1.1 and 1.5 million Armenians lost their lives during this period. Well, to tell the truth, to this day Turkey denies the Armenian genocide, but history cannot be hidden or rewritten - the one and only cure - it is the truth. If the people admit the truth it will not only heal the situation, it will heal themselves as well. If more people in this world told the truth and accepted there responsibilities of their actions the world would be a better place. TY , COMPLIMENTS AT THE GERMANY , BETTER LATE THAT NEVER , AND THE OTHERS COUNTRYS??????? I'm a great believer in the truth will set you free. Genocide upon any people is wrong. There are more sources as to verification that this happened, there is a lot of oral history within families. As to why now was this done during such troubled times, I don't know. However it's being done so....now we'll have to see how the dust settles out. Shared and following the website links you've kindly provide, Dandelion. Agree to Infinity % on Genocide being wrong. Thanks for the story Dandelion. The Turks were responsible for genocide against the Armenians despite the efforts of their Islamist government to hide the truth. Kudos to the Germans for calling it what it is. 'A Pole of Armenian descent, prominent Polish priest Tadeusz Isakowicz-Zaleski served a liturgy, where he called on them to commemorate the massacres of Volhynia and the Armenian Genocide. After speaking about the massacres of Volhynia, the priest dwelled on the Armenian history. “Armenians who immigrated to Poland settled mainly in the east of the country. The Armenian Genocide was perpetrated by Turkish nationalists, guided with the slogan “Turkey for Turks,” he mentioned. Alright, the numbers that fell ??? it sort of reminds me of the Native American genocide. The Indian people do have their count and Dominant Society (responsible for the genocide) have their count. So assuming the count on one side, those murdered was a bit exaggerated, and the count on the other side who still doesn't want to acknowledge the Native American genocide is smaller........and so assume we place that also with Armenians; there were still a heck of a lot of people wiped off the face of the Earth, simply because they all were "there" and were born that way. It is always hard to obtain an accurate count because so many ENTIRE families were wiped out, who is it left to speak out for them? I'm inclined to feel that the loss tends to be closer to the larger number because too many bodies remain unaccounted and there is no one left to speak out to their being missing to begin with. Thank you for signing our online petition voicing your support for the recognition of the Armenian Genocide! Signed and petition and shared the link all over social media, Monika. Until we acknowledge history, we cannot learn from it to avoid repeating mistakes. I'm glad one more country has shown a willingness to do so here. Good for Germany. Turkey should face up to its shame. 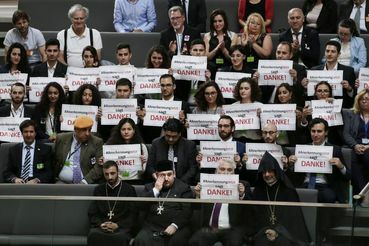 Wel done Germany, - German & Turkey have genocide in commen. What's disgraceful is that it's taken a hundred years for a Western government to formally acknowledge it WAS genocide. That short film mentioned by John De Avalon, just shared that throughout social media. Reshared your petition also all over social media, Dandelion. That that film over social media, Dandelion & John. Very poignant, especially with the music by Mahler. Just finished watching the film that John suggested, and although old, it certainly covered a lot of territory. We can thank the young girl who survived for sharing the tragedies and inhumane actions of humans upon other humans. Aurora Mardiganian had to relive this but I suppose she summoned the courage in order to present to the world what had taken place that her eyes had witnessed. No one should have to endure such and that game of swords was one I'd never heard of before and was particularly savage and totally torturous. How other humans could watch and cheer is beyond me. I will look at the movie, shortly. Speaking of genocide, and Germany, which has come to accept its responsibility (I have met a Holocaust survivor who has given talks, by invitation, about his experiences, to German High schools), I am reading a phenomenal book, by the granddaughter of Amon Goeth, the Commandant of the Plaszow, otherwise known as "the butcher of Plaszow." The book is "My Grandfather would Have Shot Me, A black Woman's Discovers He Family's Nazi past," by Jennifer Teege. Thanks for that petition Monica , Turkey cannot rewrite history, Even if the number was less than stated it,cannot deny it did happen, they murdered these people ,It has a shameful past It also slaughtered at least 3500 Pontian Greeks between 1916 -23. Turkey may argue about statistics but cannot deny or refute their brutal shameful past . Thanks for the suggested reading Mitchell. The title of the book, above,is obviously, victim to typos: "My Grandfather would Have Shot Me, A Black Woman Discovers Her Family's Nazi Past." This comes up every once in awhile and Turkey never claims responsibility. I wish SOMEBODY in our lousy govt. would find the courage to tell the sultan to just STFU! Is there any way to check the tally of signers? Signed & shared. Thanks Dandelion.